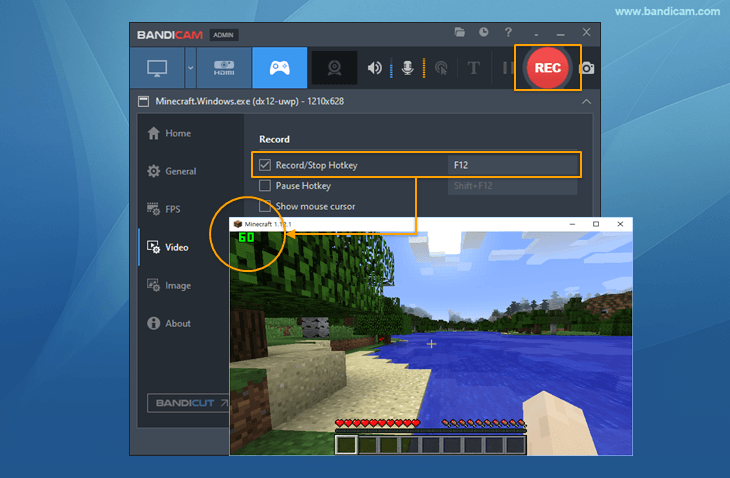 To record various 2D/3D games that use the DirectX/OpenGL/Vulkan graphics technologies, start Bandicam and choose the 'Game Recording Mode' by clicking the gamepad icon and then start the game you want to record. The 'Game Recording' mode allows you to record your gameplay without lag while showing FPS. 2. Choose the 'Game Recording' mode and start the recording target. When the recording target is executed, there will be a green-colored number (FPS) appearing in the top-left corner. » If you can't see the green FPS number, visit the FAQ page. 3. Click the 'Record' button or press the hotkey (F12) to start the recording. As the recording starts, the green-colored number will change to red. 4. Click the 'Stop' button (◼) or press the hotkey (F12) to complete the recording. 5. Go to 'Home -> Video' to play, edit or upload the captured videos. 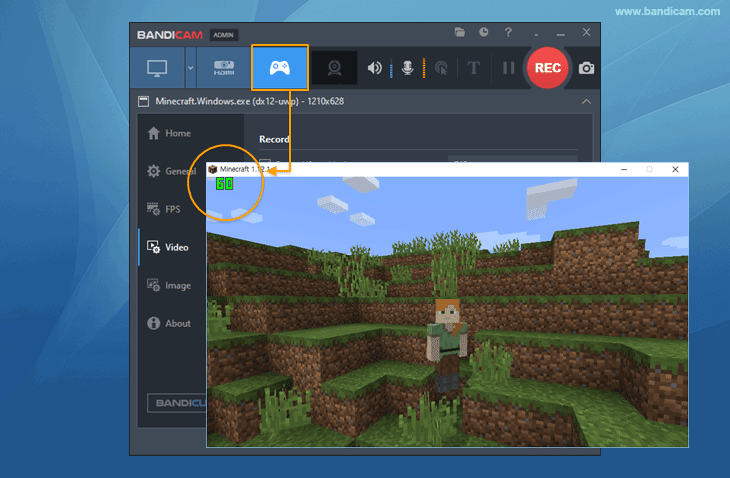 What can be recorded through Bandicam Game Recorder? 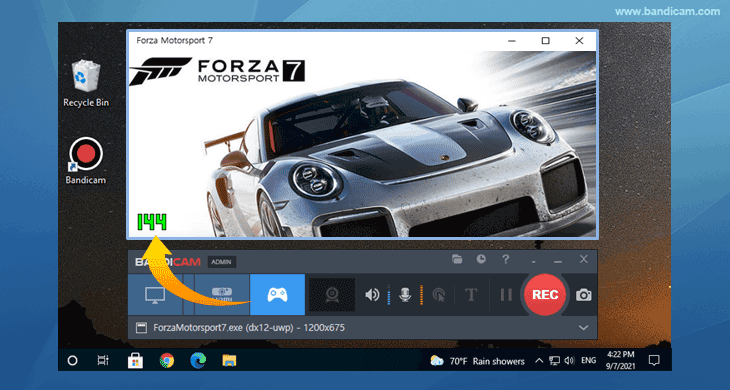 This 'Game Recording' mode can record the streaming videos that run on DirectX (Or OpenGL), such as various 2D/3D games (World of Warcraft, Minecraft, PUBG, Roblox...), internet TV streaming videos, iTunes, Windows Media Player, HDTV capture cards. 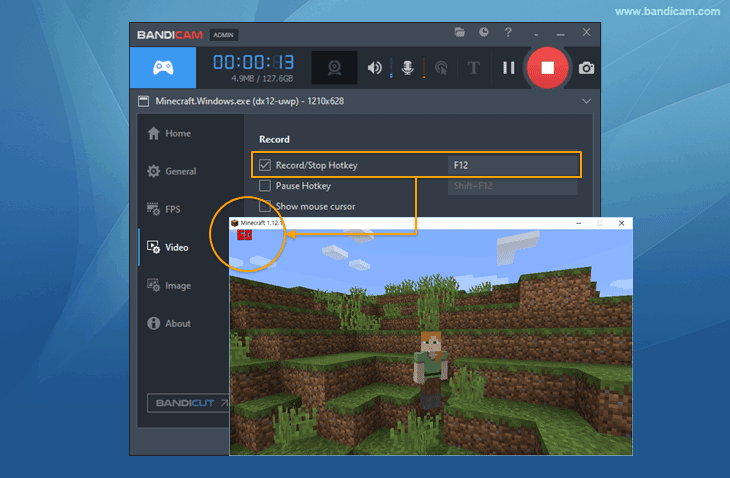 'Game Recording' mode offers a better quality recording than 'Screen Recording' mode'; If possible, it is better to use 'Game Recording' mode.